This post originally appeared on Real Clear Markets on December 21, 2016. Employers in the U.S. boosted payrolls again in 2016, giving the nation its seventh consecutive year of solid job gains. For the fifth year in a row employment gains topped 175,000 a month. In the 12 months ending in November, public and private payrolls increased 188,000 a month, or about 1.6 percent over the year. As usual, virtually all the growth was in the private sector, which added more than 2 million jobs. The public sector modestly increased its payrolls, but the number of government employees remains 750,000 (or 3.3 percent) below the peak level attained back in 2010. Given the age composition of the U.S. population, between 90,000 and 100,000 new jobs are needed every month to keep the unemployment rate from rising. Since the second half of 2010, monthly payroll gains have comfortably exceeded this threshold. As a result, the jobless rate has declined significantly. In the 12 months ending this November, the unemployment rate dropped another 0.4 percentage points, falling to just 4.6 percent, or about the same as the pre-recession rate. Since reaching a peak in the autumn of 2009, the unemployment rate has fallen more than half. Nearly all major industries except manufacturing and mining registered job gains in the past year. Manufacturing payrolls fell 54,000 in the 12 months ending in November, the first year in the past 7 that manufacturing employment failed to improve. As was the case in 2015, payrolls in the mining industry shrank more than 10 percent, hurt by continued low energy prices and the slump in exploration for new oil and gas reserves. On the bright side, mining payrolls stabilized in the second half of the year. The construction industry continued to grow its payrolls last year though only at about half the torrid pace of the previous three years. The industry has added a total of 1.2 million jobs since November 2010, but construction payrolls remain nearly one million below their level in 2006 near the peak of the housing bubble. Other industries with robust job gains included professional and business services. These saw payrolls climb 2.9 percent in the 12 months to November 2016. 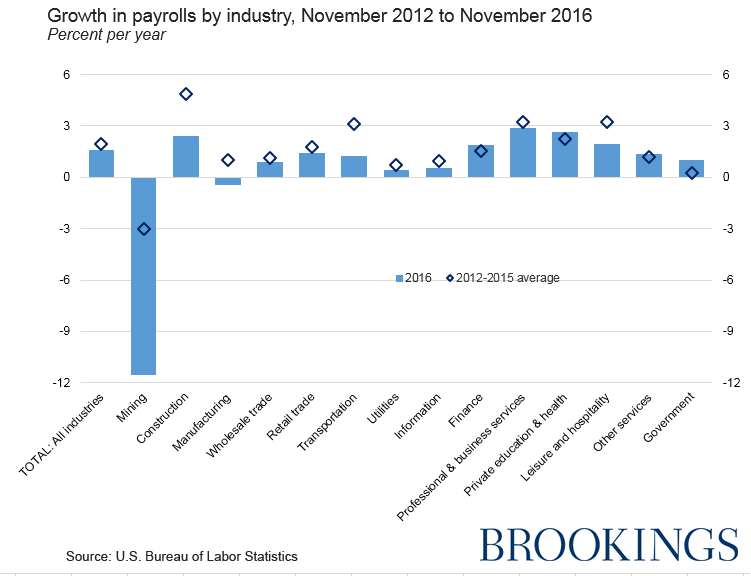 Private education and health services continued to add briskly to payrolls, which increased 2.6 percent last year. We also saw improvement in other indicators of job market performance last year. The number of Americans who want full-time jobs but have been forced to take part-time positions fell 7 percent in the 12 months through November 2016. About 9 million workers who wanted a full-time job held part-time positions in the middle of 2010. That number has dropped to about 5.7 million in recent months. Similarly, the number of Americans in long spells of unemployment continues its downward path. Workers who report they were unemployed 6 months or longer fell to less than 1.9 million in November, representing a huge improvement compared with the early months of the recovery. In 2010 more than 6 million jobless workers reported they had been looking for work for 6 months or more. In sum, the good news in 2016 is that unemployment continued to fall and real wages continued to improve. Employers report abundant job openings, and the ratio of unemployed workers to job vacancies continues to signal a tighter labor market. The more disturbing news is that key measures of labor force participation failed to rise enough to offset the big decline we saw during and after the Great Recession. The labor force participation rate of Americans between 25 and 54 increased 0.6 percentage points from November 2015 to November 2016, reaching 81.4 percent. Nonetheless, that rate is still 1.5 percentage points below its level in November 2007, just before the recession began. The failure of the prime-age participation rate to rebound sooner and more completely, despite improving wages and easier job finding, is one of the major mysteries of the recovery. 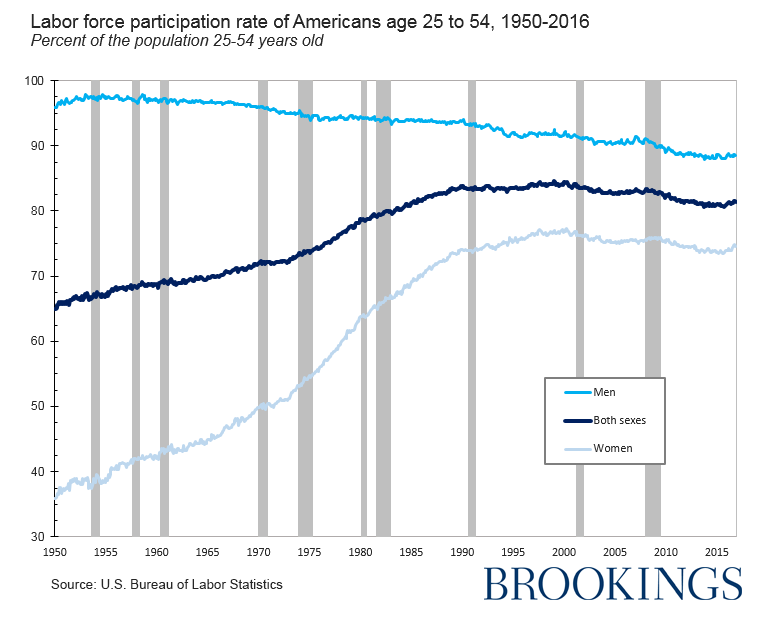 The disappointing trend in participation is almost certainly linked to longer term trends in society and the economy that have pushed down participation rates among prime-age men and, more recently, prime-age women. The President’s Council of Economic Advisors recently analyzed the long-term trends (here and here). It notes that most of the participation decline since 2007 has been concentrated among men. This is not surprising, since the prime-age male participation rate has been trending downward since the mid-1950s. Though other rich countries have experienced a similar trend, it has pushed down the male participation rate further in the United States than has been the case elsewhere. Among 34 rich countries the Council analyzed, only Israel and Italy had lower prime-age male participation rates in 2014. Some of the long-term decline in this country is traceable to declining employer demand for relatively unskilled workers engaged in physically demanding jobs. Part of it, too, is the result of shifts in family living arrangements and in women’s role in the labor market, both of which have reduced the central role of prime-age men as the principal breadwinner of a family. The puzzle about the low participation rate makes it hard to predict how long employment gains can continue at the current pace without sparking a surge in wage inflation. Many Americans entering employment every month were jobless and did not report looking for work in the previous month. In other words, these workers joined the labor force and found employment in the same month. If there are still many millions of Americans who would be willing to accept a job, but who are on the sidelines not actively seeking work, payrolls can continue to increase 175,000 a month for a considerable period. Given the age distribution of the U.S. population, about 2.5 million additional Americans would need to find jobs to restore the nation’s employment rate to the same level we saw before the Great Recession. The anemic rebound in the labor force participation rate suggests the nation may not be able to find enough willing job holders. In that case, we cannot expect future job gains to continue at the pace we have seen for the past few years.